Thanks for checking out my website! Hope you like it. Click on the Novels tab and read the first five pages of my published novels, as well as what inspired the ideas and a description of the writing process. Then click one of the links regarding where to buy the books, electronic or print copy. Check out the short stories page for a few stories, along with background information regarding them. Contact me if you have any questions or comments. Be sure to like my author page on FaceBook. Happy Reading! The winners of the Chalktrauma book giveaway! The five winners of the Chalktrauma book giveaway: Stacey H. of Ohio, Karen C. from Indiana, Leigh Ann S in New Hampshire, Allison Y. of Alabama, and David P. in Tennessee. The books were mailed earlier this month. Congratulations to the winners! September 3rd to October 3rd is your chance to win a copy of my novel, Chalktrauma. Go to www.goodreads.com, log in or create an account using your Facebook, Amazon, Twitter, or Google username and password. In the Search box at the top, type Chalktrauma and click on the magnifying glass. 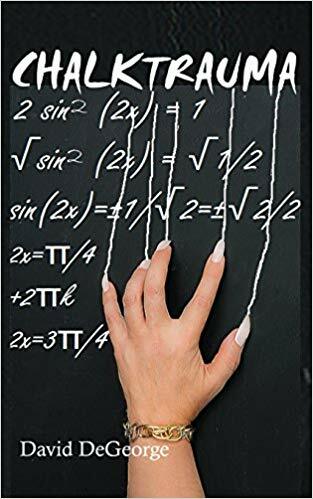 When the book cover for Chalktrauma comes up, click on it. Scroll down to the Enter Giveaway button, click on it, fill in the empty boxes, and click Enter. Good luck! What would you do if you were on a game show and promised money for answering various questions correctly—but for each incorrect answer, you received an electric shock? Imagine watching the show and learning the shocks had been given by someone who’d wanted revenge on you. What if you ran into this person later? Congrats to winners of The Chair book giveaway! 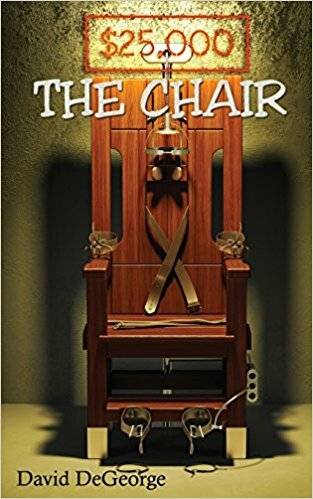 Five winners of my new novel The Chair in the Goodreads.com book giveaway: Branden E. and Z. Robinson from Missouri, Heidi G. and E. Needelman of Florida, and Chuck P. in Minnesota. Books were mailed July 3rd. Free Kindle Book Giveaway of The Chair! Click on the "Buy now with 1-Click" button and log in with user name and password. Offers ends June 27th! A book giveaway for my latest novel, The Chair, until July 1st. Go to Goodreads.com, log in using your Facebook, Amazon, Twitter, or Gmail username and password. In the search box, type "The Chair David DeGeorge" click "Search" Then click on the picture of the book, scroll down, and click the "Enter giveaway" button. Fill in the required information, then click "Add Address" Good luck! My new novel, The Chair, will be published July 3, 2018, by Silver Leaf Books. It's available to order in advance at the publisher’s website, www.silverleafbooks.com, or www.amazon.com, or www.barnesandnoble.com. How far would you go to give shocks to another person for answering questions incorrectly on a game show? What if you wanted revenge on them and were paid to give the shocks? How might you react afterwards, should you encounter this person? Congratulations to the winners of my Internment book giveaway! ​Congrats to Misty B. from Tennessee, Christel B. of Missouri, Noreen F. in North Carolina, Teri G. from Arkansas, and Tressie L. in Pennsylvania. They each won a signed copy of Internment. Win a signed copy of Internment. Go to www.goodreads.com and log in using your Amazon, Facebook, Google, or Twitter user name and password. After logging in, at the top, in the search box, type in my name. 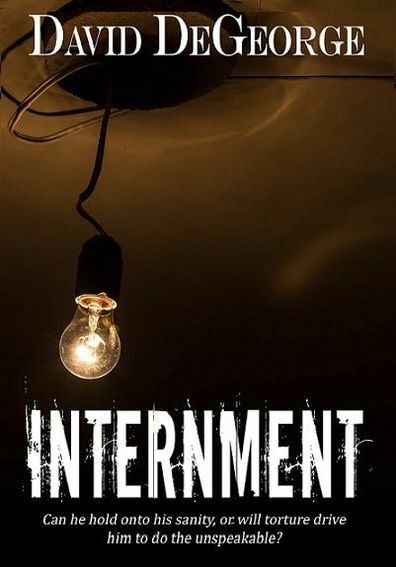 Click on the photo of the Internment book cover then scroll down and click the “Enter Giveaway” tab. Fill in each of the boxes with shipping info. then click “Add address.” The contest goes until April 16th. Good luck! Congratulations to the winners of my Chalktrauma book giveaway! Congrats to Brian B. of Nebraska, Gary G. of Florida, Michael M. of Michigan, Ricky B. from Missouri, and Kaitlyn R. in New Jersey. They each won a signed copy of Chalktrauma. Go to www.goodreads.com﻿﻿. You can log in using your Amazon, Facebook, Google, or Twitter user name and password. After logging in, at the top, in the search box, type in my name. Click on the photo of the Chalktrauma book cover then scroll down and click the “Enter Giveaway” tab. Fill in each of the boxes with shipping info. then click “Add address.” The contest goes from January 2 to March 2nd. Good luck! Congrats to winners of my Chalktrauma Book Giveaway on Goodreads! Winners of my Chalktrauma Book Giveaway: Allison M. of Pennsylvania, Cheryl B. of Texas, Tori L. from Kentucky, Shayne R. in California, and Corinne L. of Wisconsin. Congrats to winners of my Internment Book Giveaway on Goodreads! Congratulations to Mary Ann W. of Florida., Jeremy A. from Tennessee, Lesa N. of Kentucky, Elesia W. in Indiana, and Danielle C. of Arizona, winners of my book giveaway for Internment. Chalktrauma is a spooky novel where friends decide what’s more important: loyalty or self-preservation. Rock & Lilly are dating & have a substitute the rest of the year. They and their classmates goof off—until the teacher runs her long nails down the chalkboard. Suspicious incidents then occur, Rock theorizing she has a strange ability. When she takes an interest in him, he must make a choice. Will it be a good choice? Or will it result in the end of his friendships? It’s available on Kindle and as a printed version. You can also click on the Novels tab above and read the first chapter plus my inspiration for the story. I’m giving away five copies of my recently published suspense novel Internment and my horror novel Chalktrauma, to be published November 13. Go to www.goodreads.com. You can log in using your Amazon, Facebook, Google, or Twitter user name and password. In the search box at the top, type in my name. Click on the photo of either book cover then scroll down and click the “Enter Giveaway” tab. Fill in each of the boxes with shipping info. then click “Add address.” The contests go from November 1, 2017 to January 1, 2018. Winner gets a signed copy of the book for whichever contest they win. Or click on the Novels tab above, read the first chapter of each novel as well as my novel Friendship and background info. on the novels and the writing process for them. It's official! Chalktrauma will be published November 13th. It will be available at Amazon.com and Silver Leaf Books.com. Click on either link and read the first two chapters. Or click on the Novels link above and read the first chapter in addition to how I came up with the idea. Best of Books in Edmond now has my novel, Internment. Had a book signing there the other weekend and now they're carrying the book. The store is located at 1313 E. Danforth, in Kickingbird Square, at Danforth (192nd) and Bryant, northwest corner, near the east half of the plaza. The bookstore's number is (405) 340-9202 and their website is www.bestofbooksok.com. Be sure and stop by whenever you're in the area. The print version of my novel is now available at Amazon! Finally have a publication date for my ebook, Internment! I'll have further updates. Plan on having the first chapter and background info. on the novel (how I came up with the story idea, etc.) here later. Hope everyone will like it! Chalktrauma to be published in 2017! Chalktrauma, a horror novel, is to be published sometime late in 2017, by Silver Leaf Books. What is more important: Loyalty or self-preservation? When classmates have a substitute teacher with an unusual ability, they confront this question. High school seniors Rock and Lilly are dating when Bella, a substitute trigonometry teacher, fills in for the rest of the year and takes an interest in Rock. Though attractive and alluring, Bella isn’t afraid to instill discipline in her class and metes out punishment in a unique way—by running her long nails down the room’s blackboard. After several strange incidents, Rock decides it’s best to accept her advances. This causes friction between the young couple and their friends. When his relationships reach a critical point, Rock must make a choice. Will it prove beneficial? Or will it result in the end of all their friendships? This one's still early in the publication process—haven't even gone through the first edits though the above cover and back-of-book-summary have been accepted. After nearly ten years of rejections, two books to be published in one year! Go figure. Will give updates as soon as I know more. My novel, Internment, to be published! Internment, a psychological suspense novel, is to be published by The Wild Rose Press sometime this year. Eighteen year old Justin Hopkins ekes out a living writing freelance articles for magazines. When he receives an offer from his psychiatrist uncle to help write about groundbreaking research, Justin jumps at the chance. He travels to his Uncle Blake's isolated ranch with hopes of big-time publication. There, however, he is held captive and worn down, physically and mentally, by Blake and his followers—all, as Blake professes, to make Justin as ‘ strong as possible,’ in body and mind. Can Justin survive the torment? Or will he succumb and join the others, even bring harm to someone else, now believing it will make them as ‘strong as possible’? I’ll have further updates here and on Facebook. Hope to have the first chapter online as well as background information on the novel (i.e., how I came up with idea, writing process, etc.) and where to buy the book. Be sure and check back. Saturday January 21 at the Edmond Historical Society, 431 S Boulevard, Edmond, OK (two blocks south of E. 2nd St. and Boulevard, west side of Boulevard). From 1-4pm. Congratulations to Frederick R. of Oregon, Kathy W. of Tennessee, Brooke P. of Arizona, Debbie W. of Georgia, and Robert T. of Pennsylvania, the winners of my Goodreads.com giveaway! Mailed the books August 11th, 2016. Hope they like the story. Click the Enter Giveaway link then log in using your Facebook, Amazon, or Twitter username & password or set up a username and password then fill out the online form. Or go to www.goodreads.com, do a search for my name, and click the link for the novel Friendship then click the Enter Giveaway button. Log in using your Facebook, Amazon, or Twitter username & password or set up a username and password and fill out the online form. Tell anyone you know who likes reading about my giveaway! I’ll be doing a book signing Saturday, May 21st, from 1-4pm at the Edmond Historical Society Book Fair, 431 S Boulevard in Edmond, OK, N. of Oklahoma City. Stop by and be sure to let everyone know! I have a book signing Saturday, April 9th from 3-5pm at Hastings Books in Yukon, OK (suburb west of Oklahoma City), in the Chisholm Shopping Center, on the east side of Garth Brooks Blvd, N. of I-40 in Yukon. Congratulations to Erin A. of Indiana & Betty S. of Georgia for winning a copy of my novel, Friendship! I mailed the books 11/17/15. Sure hope they enjoy the book. The novel Friendship has friends questioning each other’s trust and respect as life presents serious challenges. Arturo and Sophia plan a special night but circumstances prevent this from transpiring. Sophia then finds a suggestive photo of Arturo, which strains their relationship. Renaldo deals with alcoholic parents and his own temptation to drink, especially during a crisis involving his girlfriend. Millicent struggles with her introversion and an overprotective mother. Conrad is out to prove his manhood to his buddies. Wyatt has strong principles that are tested by the lure of the flesh. And Andrea thinks every guy she meets is Mr. Right—until a few dates, when he becomes Mr. Wrong. Impatient, she wonders if she will ever find her man. The responsibilities of adulthood have the friends drifting apart and feeling alone, even helpless. When the most formidable situations arise, will the friendship last?